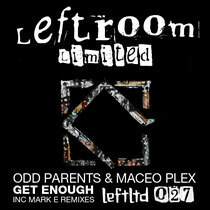 Leftroom Limited follows up the contribution from Waifs & Strays with Maceo Plex teaming up with Odd Parents and Mark E turning in two remixes. Much like Ellum Audio’s Maceo Plex, Odd Parents are US expats now residing in Spain and, having released on Ellum earlier in 2012, have become part of the label’s family unit. This is the second Odd Parent’s collaboration this year with the duo’s remix of D.Ablo & Eric Volta alongside Danny Daze creating enough of a buzz to tempt Maceo Plex into the studio with the Philadelphia pair for ‘Get Enough’. ‘Get Enough’ comes on strong from the off, with an arpeggio bassline giving off a massive portion of elastic funk while an arsenal of floor focused drops and audio trickery are employed to effect throughout. Looped, chopped and stretched vocals all play their parts in adding to the hooky nature of the track. No stranger to the concept of discoid electronics, Mark E cooks up two remixes of ‘Get Enough’. The Ghostly artist and Merc honcho channels a hip-housed Chicago style in his remix – all resonant keys and emotive strings making for one of his best sounding works to date. The Mark E Future Doom remix is an insistent, tightly looped affair that bursts out of the gates with high hats blazing and fever-pitch builds which offset playful, deep melodies and blissed out vocal snippets. Old school structuring with a distinctly modern palette of sounds, it’s another arresting interpretation from a producer who knows how to balance and control aggression.